If your house is anything like mine you have the eternal problem after about two days of Christmas ..
Oh, what do you do when, every time you revisit the fridge, there appears to be even MORE leftover turkey. Can people actually be sneaking in past the dosing springers and leaving their unwanted turkey in our fridge? Well, here are a few simple solutions that will wake up those taste buds. This really is a fancy description for a curry! Empty soup into large saucepan; add turkey, and heat, stirring, to simmering point. Add the spinach, put lid on saucepan, turn off heat, and allow spinach to wilt for a few minutes. Remove lid, stir spinach into turkey mixture and gently bring back to simmering point. Season with salt, pepper. Place garnishes in individual bowls. Serve with brown rice, poppadoms, or crusty bread and a green salad. Empty contents of black bean soup into medium saucepan, add diced turkey and diced red chilli, optional, dependant on taste. Heat gently till simmering and season. Assemble wraps: Place ¼ of this mixture in centre of each tortilla, and fold up envelope like, placing the 4 wraps side by side in an ovenproof dish. Bake in centre of oven for approx 20 to 25 mins, then sprinkle over the red onions, and leave in oven for a further 3 to 5 minutes. Serve with following sides: Tomato salsa, crème fraîche, mixed leaf and cherry tomato salad. Ok, this granola wasn’t intended to be my first recipe on the blog (that was to be a new majestic soup recipe), but this recipe is actually a big, no, not big, a massive win for me in my house. It started innocently enough, the love affair between my 13 year old and the chocolate coated rice pops. A trip to an aunt in London, where the small cereal variety boxes were descended upon each morning with glee. Back home, during the school holidays, I managed to side step the odd request for said choc pops. However, as the new school year started, the serious pleading for the purchase of the choc pops began … did i not realise just how much better his mornings would be if only he could have that lovely chocolate bowl of deliciousness like all of his friends. It was the sheer scale of the desire for said cereal that got me thinking a few things at once one morning : the chocolate ingredient was central, the rice pops were not. So what about a really healthy breakfast, but with a little chocolate added, still making a pretty healthy breakfast? It just had to be a chocolate version of my toasted muesli/granola! A few trial runs later, and we have it sorted, with the breakfast time happy again (for the moment). Lightly oil a large baking tray or cover with baking parchment. Place oats in generously sized mixing bowl; mix syrup/honey and oil together in a small bowl (if using brown sugar, will need to heat sugar and oil together gently in saucepan to allow the sugar to dissolve and mix into the oil), add to oats, and mix very well – you want to get each oat flake coated with the mixture as this will yield a crunchier granola. Pile onto baking tray, spread evenly, place in middle of oven, bake for 40 to 50 mins, turning mixture over a few times, to ensure even browning. Once cooked, take out of oven and leave to cool to room temp. When cool, pop back into large bowl used earlier for mixing. Next, break the chocolate up and either microwave to melt (being careful not to burn), or place in a bowl over hot water to melt. Add the melted chocolate to the now cooled, crisped oats, mix very well to ensure even chocolate distribution, spread out mixture on tray and allow to cool again; once cool, store in an airtight container. Will keep for 1 month, but will not last that long! Above quantity makes approx 20 generous servings of 40 g each, which have 7.5 g of chocolate each – this is actually just a little over one square of chocolate per portion (a good stat to hold in ones head, in case one begins to feel guilty about the chocolate addition). Amazing really, this is a small indulgence for a big flavour impact! Walnuts, hazelnuts, peanuts, chopped brazils almonds (50 g in total). Fresh fruit such as blueberries, strawberries, sliced banana, go very well also. Hope you try this and enjoy. Love to hear back from anyone. 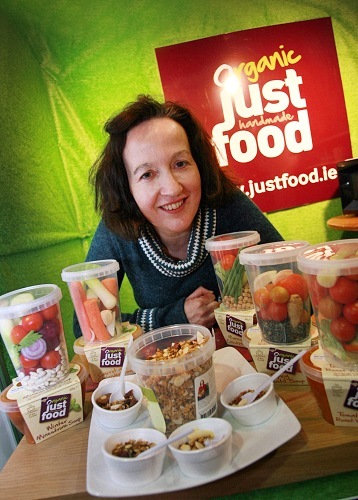 Welcome to the Just Food Blog – to be honest we are still not 100% sure what we will be writing about so you will have to stay tuned! We are passionate about all things food, so yes we will be talking about that …. including recipes for quick easy meals (that’s me and most mothers ….always in a hurry!) and some other little titbits to keep you interested – well at least that’s the idea in any case.